Staying on most diets is hard work. Often, the diets you try have restrictions on what to eat, or you end up adding points or calories all day. 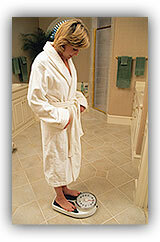 If you want to lose weight sensibly, the key is to manage what is called your energy balance. Simply put, this is the difference between energy contained in the food you eat and the energy used by your body on a daily basis. All you need to do is tilt the energy balance in your favor! With Do-It! you can view a summary of your day at a glance. The science of human metabolism is pretty well understood today because of the outstanding research done by doctors and exercise physiologists around the world. Unfortunately, most diets on the market today simply ignore this body of knowledge. Do It! diet software was built with this knowledge in mind, and the end result is a weight loss product that helps you safely and sensibly lose weight by burning calories and eating healthy. Do-It! uses this research to your advantage. We have compiled into one computer program the tools you need to make your diet really work. By combining body fat analysis, metabolic rates, exercise burn rates, and a large food database with complete nutritional information, now you can reach your diet goals. With proper diet and exercise, burning calories and weight loss can be achieved. Do-It! gives you instant feedback to let you know if you are on track to your diet goals. At a glance, you can tell if you are within your calorie limits for the day, whether your ratio of fat/carbohydrates/protein is correct, and if you are getting the appropriate vitamins and minerals each day. Stick to your goals, and you'll get immediate reinforcement that you are on the path to sensible weight loss! You don't have to eat foods you don't like and you don't have to totally cut fast food out of your diet to eat healthy. By combining a variety of foods in your diet, and using Do-It! to see where you need changes, the power of healthy eating is now back in your hands.